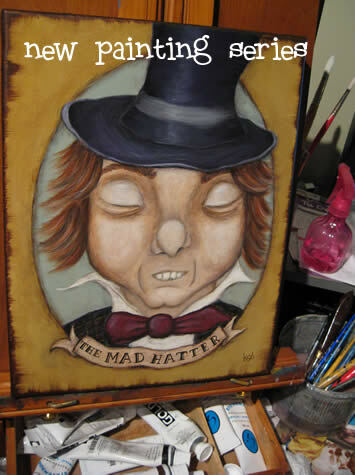 I’m a huge Alice in Wonderland fan & have been plotting a series of Alice paintings for years. There are so many fantastic scenes that would make amazing paintings that my biggest problem has been not knowing where to start. If I’m going to do Alice, I want to do justice to both Lewis Carroll’s story and the enchanting illustrations of John Tenniel. A tall order! I got a new copy of the book a few months ago, an annotated collection with both Wonderland and Through the Looking Glass in one book, plus lots of odd little footnotes and interesting blurbs. Every few pages a new note goes into my sketchbook under painting ideas – walrus & the carpenter, caterpillar, drink me. I have pages and pages of sketches, but this month I finally started painting and I’m tickled with the results so far. 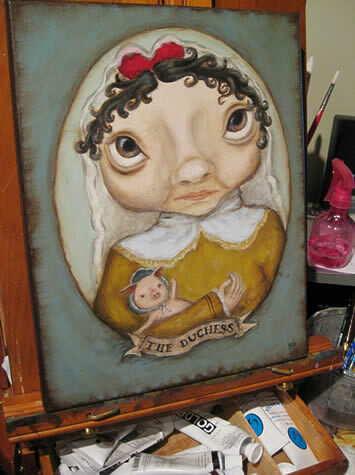 With the Tim Burton movie coming out in March, it was high time for me to get busy on my Alice paintings. I love Tim Burton and I’m so excited to see what he does with the story, but at the same time, I don’t want his version of Alice to influence my own paintings. Influence and inspiration are a tricky bunch. We’re all influenced by other artists every single day. Even if you never set foot in a museum or gallery, art is everywhere. From movies and tv, to the graphic designers working on ad campaigns to the packaging you see at the grocery store – it’s unavoidable. And for the most part, that’s just fine. But with this…I don’t know. I’d almost like to do two sets of paintings – one pre-Burton and one post. Would make for an interesting experiment, no doubt! Chances are I won’t have time for that little experiment though because I’ll be busy co-organizing a local Alice-themed art show (and tea party, of course). The details aren’t quite finalized yet, but I’m going to be putting a call out to artists very soon and my brain is bubbling over with ideas. I’ll need a costume too. Oh, this is going to be such fun! Who’s your favorite Alice character?